"Billy King & the Bad Bad Bad, like their name suggests, have a fascination with 50s grease and teenage lawlessness. Pegged as "surf rock from hell", the local's songbook is certainly populated with chthonic monsters: werewolves, reapers, and demons all make appearances. Like a band lifted from the screen of a malt shop horror, Billy King is a carnival of fun, evoking a bygone era of rebellion, Marlon Brando, and beach parties. While their acid-baked garage rock undoubtedly recalls bands like The Oh Sees and Ty Segall, Billy King & the Bad Bad Bad manage to emerge from the deluge of reverb n' overdrive as luminaries, using their unabashed appreciation of 50s kitsch to forge new pathways." "It's a rarity to see a band hit the ground running quite like Billy King and the Bad Bad Bad have in the past few months. Ominous drums, twanged guitars, and the otherworldly howl of Will Reynolds all coalesce to evoke a behemoth of a sound that is as sinister as it is hard-hitting. Reynold's impeccable vocals oscillate between a theatrical Screamin' Jay Hawkins and a Southern-styled Andrew Stockdale of Wolfmother. Bonham-esque percussion from Marty Chronister serves as the backbone from which the surgical guitar-stylings of Cam Wren spring forth, comprising equal parts power chords and face-melting solos. Frills and gimmicks are lacking as this trio smashes through a short but transcendent thread of songs that are now finally available on their debut EP Fever Dreamin'. The jittered punk diddy "Werewolf of Love" is an earworm of the highest order while "The Night Terror" slow-creeps into one the most cathartic choruses of recent memory. Billy King and the Bad Bad Bad don't need time to figure themselves out, they stand ready to unleash their hell fury unto us with wicked abandon, and you'd be a fool to deny their sacrament." Billy King & the Bad Bad Bad Release Debut Music Video "Mathematics"
"Billy King & the Bad Bad Bad, like their name suggests, have a fascination with 50s grease and teenage lawlessness. Pegged as "surf rock from hell", the local trio's songbook is certainly populated with chthonic monsters: werewolves, reapers, and demons all make appearances. Like a band lifted from the screen of a malt shop horror, Billy King is a carnival of fun, evoking a bygone era of rebellion, Marlon Brando, and beach parties." 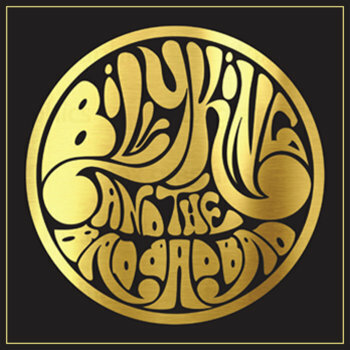 "It's a rarity to see a band hit the ground running quite like Billy King and the Bad Bad Bad have in the past few months... Ominous drums, twanged guitars, and the otherworldly howl of Will Reynolds all coalesce to evoke a behemoth of a sound that is as sinister as it is hard-hitting. Reynold's impeccable vocals oscillate between a theatrical Screamin' Jay Hawkins and a Southern-styled Andrew Stockdale of Wolfmother. Bonham-esque percussion from Marty Chronister serves as the backbone from which the surgical guitar-stylings of Cam Wren spring forth, comprising equal parts power chords and face-melting solos.